European shipowners have called for a swift ratification of the 2009 IMO Hong Kong Convention (HKC) in a position paper published earlier this week. The Convention is aimed at ensuring that ships, when being recycled after reaching the end of their operational lives, do not pose any unnecessary risk to human health and safety or to the environment. European shipowners also called for a smart application of the 2013 EU Ship Recycling Regulation (EU SRR) so that the latter act as a lever by incentivising ship recycling yards to upgrade towards compliance with the HKC requirements. “We need to ensure that the Hong Kong Convention is ratified as soon as possible,” commented Patrick Verhoeven, ECSA Secretary-General. According to ECSA, the ratification efforts have become bogged down due to the entry into force criteria of the Convention, which require both major Flag States and Recycling States to commit to the HKC, leading to a wait and see whereby both sides bide their time in anticipation of the other side’s move. “European shipowners therefore support the European Commission and Member States in pushing all IMO Member States to ratify the HKC,” ECSA said. 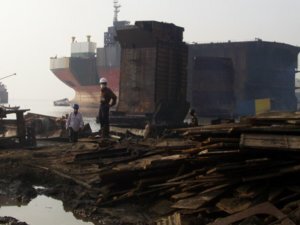 EU shipowners believe that the EU Ship Recycling Regulation, adopted in 2013, can become a valuable tool in bringing the world’s biggest ship recycling yards closer to HKC standards by allowing them to apply for inclusion on the so-called EU List of approved recycling yards where EU flagged ships can be dismantled. “The Commission needs to set in place an inclusive procedure which would allow all yards to apply for admission to the list. It would thus provide them with a strong incentive to change and improve their practices, bringing them closer to the HKC quality levels,” said Mr Verhoeven. ECSA said it is the responsibility of shipowners to ensure proper recycling of their vessels, especially during the interim period before the entry into force of the HKC and the application of the EU SRR.